"I have no idea what to say next. I don't speak Japanese, I don't know anything about Japanese business or Japanese culture. Apart from sushi. But I can't exactly go up to him and say "Sushi!" out of the blue. It would be like going up to a top American businessman and saying "T-bone steak!" "It's his mother's birthday? But he didn't tell me. I don't have a card. I don't have a gift. How could he do this to me? Men are crap." Men are crap indeed and I'd love to go up to someone and be all fruit loops just random lol I may just do it now. 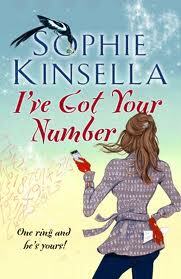 I've read quite a few Sophie Kinsella books and enjoyed them all, but I haven't seen this one. Thanks for posting an excerpt from it. My teaser is here (Sandy's Teaser) along with a relevant movie trailer. Interesting teasers--does she learn some Japanese?